When the Queer Eye revival debuted on Netflix earlier this year, it was an instant heartwarming success. Over the course of eight episodes shot in the greater Atlanta area, we watched as the new Fab Five (a quintet of breakout personalities that somehow managed to out-charm their predecessors, much to our surprise) bring their estimable talents to men sorely in need of lifestyle adjustments and, more often than not, shifts in perspective and confidence. Connections were made, avocados were sliced, and the tears flowed freely as our guys spent a week with each of their cisgender, mostly straight males. It was a winning formula, as the shift to the streaming service allowed us to not only get to know the "heroes" a bit deeper than on the original Bravo incarnation, but also let us into the lives of the Fab Five for the first time in the franchise's history. And they could've continued to follow that formula for future seasons to come with no complaints from us. But that's not what happened. And we're so glad it didn't. 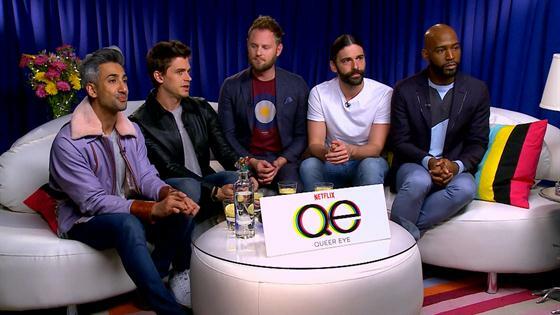 With its second season, consisting of eight episodes that dropped on Netflix on Friday, June 15, Queer Eye managed to level up and deliver on its true potential with two very special episodes that deserve talking about. Right off the bat, in the premiere episode, the show shook things up by sending Antoni Porowski, Bobby Berk, Tan France, Jonathan Van Ness, and Karamo Brown to work their magic on their first female. In Gay, Georgia, we met cancer survivor Tammye, a woman so committed living a life of service that the school teacher who makes time to visit sick children after school asked the Fab Five to renovate her church's community center rather than her own home. Over the course of the hour, we also met her gay son Myles, who'd had a rough coming out experience and was fearful of returning to the church that meant so much to him growing up—and still means the world to his mother. We sobbed as Tammye recounted her "come to Jesus" moment over Myles' sexuality and her quest for forgiveness from her son. We sobbed even more as Tammye helped Bobby have a breakthrough over his own issues with religion following his own harrowing coming out. And then we sobbed the hardest when, at the end of the week, Tammye celebrated each of the Fab Five for the ways in which they light up the world. It was an episode that truly flipped the format on its head and seemed to allow for more growth within the Fab Five than it did for Tammye, to be honest, but that's what made it so incredibly special. To see Karamo work with Myles to find a way to return to his faith and not fear it, to see Antoni's cynicism over religious folks' propensity to truly change give way to a torrent of tears in their final moments with Tammye, to watch Tammye deliver a powerful sermon over accepting homosexuality as a child of God to the approving nods of her congregation; it was all so incredibly moving and would've never happened if the show hadn't flipped the script. And though the next three episodes went back to the traditional hero, episode five broke from tradition yet again. Our first introduction to Skyler is a stark one, as we, along with the Fab Five back in their loft, watch as he undergoes his top surgery, aka the surgery that transgender males go through to have their breasts removed. In a startling and profoundly touching moment, we're allowed to witness Skyler, still a bit out of it from the anesthesia, look down and see himself for the first time. To see his reaction feels like watching a deeply personal moment that we have no right spying on, but it's deeply moving. From there, we watch as the Fab Five help appropriately age up Skyler's masculinity while he sets out to achieve the ultimate act of validation for any trans individual—successfully petitioning to have the gender marker on their driver's license switched—but the hour is all the more powerful for the way we get to watch Tan, who had never met a trans person and admittedly, despite being a staunch ally, struggled to understand their plight, get to learn along with us at home. It's a powerful hour of television that has the potential to do a lot of good at a time when the trans community needs allies more than ever. This isn't to say that the other six episodes in season two weren't worthy of our time. They were all wonderful, though, we can't lie, Arian's lies in the sixth episode left us rather annoyed with him throughout much of his episode. But by broadening the format, the show tapped into what makes it really special: watching these five fabulous men make deep connections with people they might not otherwise in a way that allows for everyone, heroes and Fab Five alike, to learn a little something about themselves along the way. By allowing for us to get to know the Fab Five in a deeper way, the revival's been able fire on cylinders that weren't even possible when the show first debuted in 2003. In a world that's seemingly bedeviled with darkness at every turn—just take a look at the news (or better yet, don't)—to have a show that radiates positivity, fosters communication, and celebrates our common ground is an absolute blessing. We can believe, Jonathan. In fact, we do. Queer Eye is now available to stream on Netflix.